The second part of this superb tale continues with hardly pause for a breath after the first one. When a story is impressive and then the second part maintains the quality of the first, I’m happy.Once again I found myself soaking up the atmosphere and the emotional turmoil in which the main characters are involved. Ella’s young life is akin to her being on a speeding train with no driver and no brakes. Jem, on the other hand, is the same impulsive guy we met in the first part of the tale, but now he’s on foreign soil, and his punishments come in many forms, official, and unofficial.I made mention of the wonderful imagery in my first review, and I have to say, this author doesn’t let up - the almost cinematic descriptions continue. The only thing missing from the reading experience are the various smells.Apart from the time at sea, we are treated in this episode to some superb adventures, or more correctly misadventures on land. Some of these involve Ella, back in England, while others are the misguided judgements of Jem in Australia. Can either of them trust anybody - it seems not.Another impressive piece of work. 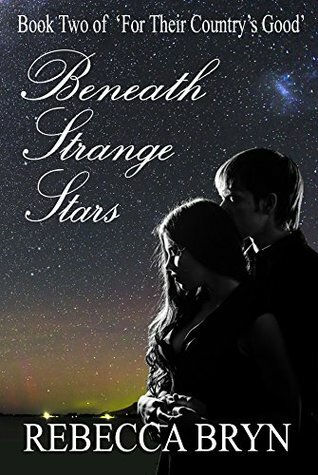 Beneath the Stars, book 2 in the series For Their Country’s Good will pick you up and transport you back to the days of convicts and the beginning of settlement in Australia. Rebecca Bryn’s characters are so real you will feel their emotions as if they were your own. You will be swept along, breathless, from one disaster to the next, never knowing what these impulsive and sometimes desperate characters will do next. Read On Different Shores first, Book 1 in the Series and you will be hooked! Rebecca Bryn - Rebecca lives in West Wales with her husband and dog, where she paints the fabulous coastal scenery and writes tales with a twist.